Wikki Stix Spring and Easter Learning Crafts for Young Kids! With the arrival of spring and Easter just around the corner, it is a fun time for young kids to create and learn with Wikki Stix! Print the poem for the children and read several times. If desired, an adult and child can alternate turns reading the lines for each of the Easter Eggs or the children can take turns reading if doing the activity with a group of children. There were 5 Little Easter Eggs in a basket all alone. They were waiting for the Easter Bunny to come and take them home! Then the 5 little eggs watched the BUNNY hop with PRIDE! He took the eggs and basket on a hippity, hoppity, ride! 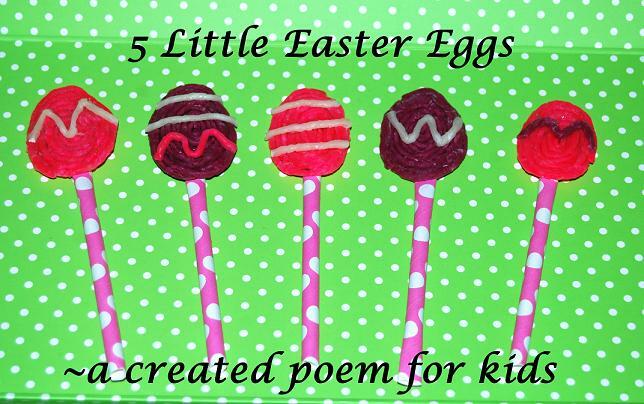 When the children are familiar with the poem, extend the reading by making Wikki Stix Easter Eggs to hold up when the lines of the poem are read. To make the Easter Eggs: Invite the children to craft by setting out the Wikki Stix, scissors, and the straws or craft sticks. Using one Wikki Stix at a time, have the children wrap the Wikki Stix around itself to make a circular shape (spiral). 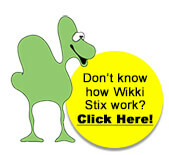 Each Easter Egg uses 3 strands of Wikki Stix wrapped around itself (see photo above). When the spirals are finished, invite the children to mold the top of the circle to resemble an egg shape. The children can decorate their eggs by cutting smaller pieces of Wikki Stix with scissors and making patterns on the eggs. (Please note – Wikki Stix can be cut with safety scissors, but younger children may require assistance). Place each of the Wikki Stix created eggs on top of a straw or craft stick. The children can then hold up one egg at a time as the poem is read. Materials needed: One printable (linked above) for each child, scissors, and assorted colors of Wikki Stix. Print page 3 of the Easter Egg Patterns file and laminate for durability (if laminating supplies are not available, clear contact paper works well). 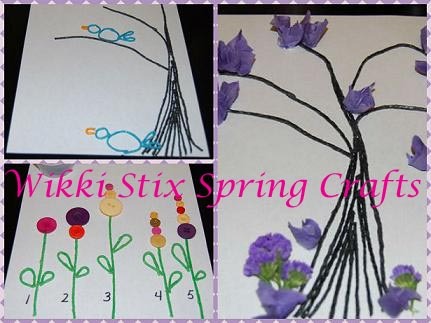 Cut out the larger Easter Eggs and invite the children to create Easter Eggs designs with Wikki Stix. Adults can also create designs for younger children to see if the children can copy/transfer the same designs to their own eggs using Wikki Stix. Older children can create designs independently. The smaller eggs in the Easter Egg Patterns file can be cut out, laminated, and numbered with any numbers the children are working on or have had introduced. Invite the children to use Wikki Stix to create the numbers on their own eggs. The addition of the tactile sensory layer will help the children with basic number recognition. The children can also use the different colored eggs in the file to make basic Easter Egg patterns: AB, ABC, AABB, AABBCC, etc. Cut out each of the colored eggs and invite the children to make a repeating pattern with the eggs. For an AB pattern, the children would use two colors of eggs. EXAMPLE: GREEN/PINK/GREEN/PINK/GREEN/PINK would make a repeating AB pattern. We wish you a delightful season of creating and learning this spring with Wikki Stix!